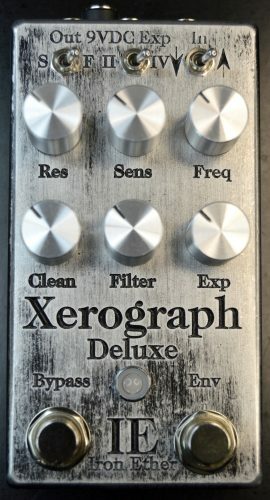 The Xerograph Deluxe is a 4-pole resonant lowpass filter, inspired by synthesizers, with deep envelope capabilities and expression control, which can be used together or separately. 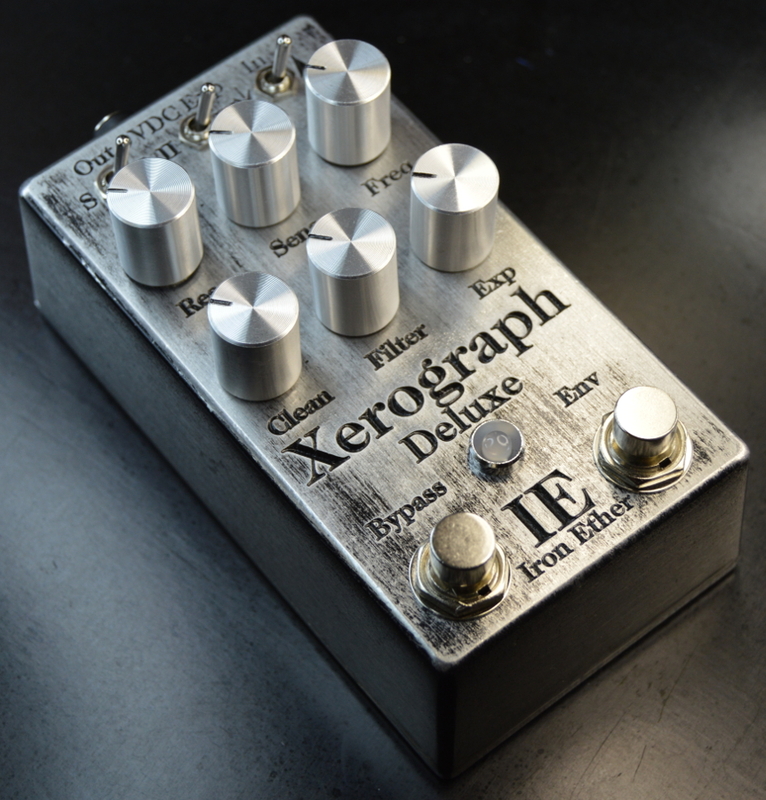 In addition to the dubby static lowpass sounds and foot-swept resonant filter sweeps of the original Xerograph, the Xerograph Deluxe can create envelope filter sounds from classic auto-wah to modern subtractive synthesis, downward envelopes, and triggered slow synth sweeps. Version 2: The XD has been retooled with a new expression attenuator knob, a stomp switch to activate the envelope follower, all jacks on top, improved envelope response in Down mode, and some subtle tweaks that make it easier to dial in. Frequency: Sets the cutoff frequency of the filter, removing frequencies above this point. When using an expression pedal with the Xerograph, the Frequency knob sets the minimum frequency of the filter sweep. Resonance: Boosts frequencies around the cutoff frequency, which intensifies the effect of the filter. Set the resonance low for more subtle tone-shaping, or turn it up to around 3-o’clock for wet synth sounds. Turning Resonance to maximum sends the filter into self-oscillation. Filter volume: Sets the output volume of the filtered signal. Clean volume: Sets the output volume of the clean signal, blended in with the filtered signal. Sensitivity: Controls how much the playing dynamics will sweep the filter cutoff. Exp: Acts as a limiter on the expression pedal, setting how far the expression pedal can sweep the filter cutoff. 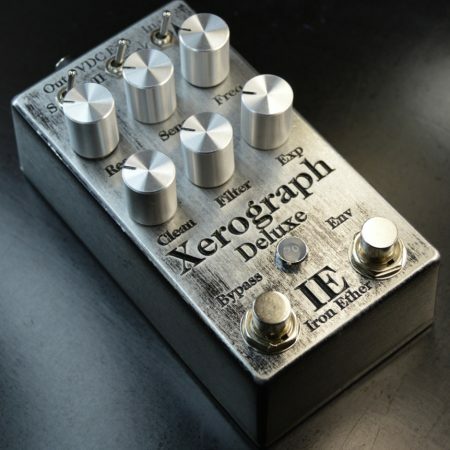 Combined with the Frequency knob, using the Exp knob, the expression pedal can be set to cover any frequency range, from the full range of the pedal, down to a few semitones if required. Envelope stomp switch: Activates the envelope follower. This switch allows you to move seamlessly from a static dub filter to a wet envelope filter with a stomp. The LED will change from blue to turquoise when the envelope is activated. Slow/Fast switch: Alters the response time of the envelope. 2-pole mode is a classic, funky filter with a wide, vocal-like resonance peak. 4-pole mode offers a fat, deep, and synthy filter with a sharp resonance peak. Down/Up switch: Sets the direction of the envelope sweep. Low-noise, low-distortion active components chosen for excellent audio fidelity. Measures 4.7″ x 2.5″ (12cm x 6.3cm). Runs on industry-standard 9 volt DC center-negative power supply. 85mA current draw. All jacks are located at the top of the pedal to save pedalboard space. Learn more about the construction of IE pedals here.